They have a V8 as well from their CART days. I just feel that if this car is going to be taken seriously as an exotic it has to be at least a V8. In no way could any manufactuer simply throw a racing engine in a production car. Those engines cost millions in development costs and even more millions in mainetenace and service. And they are extremly unrelaible needing a rebuild after a one or a few races. Even the greatest racing company in the world, Ferrari did'nt use their Formula one engine in the greatest supercar of all time. The Enzo uses a V12 which may be loosely based on their F1 engine but probly does not share 1 single part. But I do agree that the next NSX should have V8 power or at least 400+ HP by some means. I would'nt hold my breathe for a Honda V8 anytime soon though. Geez, why doesn't Honda just drop one of its F1 engines in it (V10 or V12? ), like McClaren did with it's F1 exotic. I'm sure Honda could detune it and smooth it out a little (although it would probably get 5 miles to the gallon). Huh??? There is no way you can put an F1 racing engine in a street car. It would neverl meet emissions. . Plus the gas mileage would be horrible , even they could even run on regular gas. Not to mention the price..and reliability...those things are only designed to run for a few hours reliably. I could go on and on. The Street Maclaren F1 didnt have an "F1" engine, it was an engine built by BMW specifically for that car. EDIT: Just read domns post .. and we are saying the same basic thing. All these guys saying put an f1 or cart engine in a street car are smokin crack. Really? You don't say. I was kidding about their racing engines... but they could leverage that technology for this type of car. And I don't even think they can "leverage" that technology. Car companies love to advertise how their racing technology makes it down into their production cars. I wonder how much of it actually makes it to production. The only feauture I can think of recently that made it down from racing to production is the paddle shift system from Formula one. Then again, I'm sure there's plenty of racing technology from rally cars to production ie WRX, EVO. Who really knows. Well, in recent years, I can't really think of many breakthrough technological innovations that have made it from F1 to commercial use. Yea, the paddle shift is in the form of F1, but unless it's in an exotic or high end luxury car, since the rest of the paddles are just like manumatics. For us Honda lovers, the original VTEC was the hand-me-down from the F1 and other Honda racing research. If you remember, the original VTEC had that lack of low end umph, and you had to crank your engine to get things going. They cleaned it up with changes, creating the iVTEC. Junkster, who would love the paddel shift on a tsx. domn, i was replying in jest to gebbeth... who mentioned the V10/V12 from F1. The HSC show car is "a realistic proposal" for the next-generation NSX, says Honda President Takeo Fukui. TOKYO - The 13-year-old Acura NSX sports car will be replaced soon by a car much like the HSC concept coupe shown at the Tokyo Motor Show, Honda President Takeo Fukui disclosed last week. "I want to bring it out soon," Fukui said in an interview for the annual Automotive News Talk from the Top series. "Everybody is waiting for it. It won't be in a year, though." Fukui called the two-seat HSC concept "a realistic proposal" and said the production NSX would not change much from the show car. 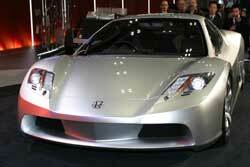 The HSC concept, which had a 300-hp V-6 under the hood, is shorter, wider and lower than the current NSX. "I like the overall proportion of it," Fukui said. "Its compactness is attractive." The NSX, which has a small but passionate following among performance enthusiasts, has not been fully remodeled since it debuted in 1990. Reflecting its age, worldwide sales last year totaled only 364, with the U.S. market accounting for 233. The car's worldwide sales peaked at more than 4,500 in 1991. "This is not a volume car, so it has be aimed at the global market," Fukui said. The replacement for the nearly $90,000 vehicle is part of Honda's move to shore up the Acura brand. The automaker also will update the Acura RL, due out next fall, by dropping front-wheel drive. On another topic, Fukui said Honda may increase imports of U.S.-built vehicles into Japan if the yen gets much stronger. The dollar has fallen to about ¥108 from around ¥120 since August, yielding less yen profit for Japanese companies for every dollar of sale. "We have to think of different ways" to adjust, he said. Honda imports the U.S.-made Element and the Canada-built MDX and Odyssey minivan, which is sold in Japan as the LaGreat. Through September, the automaker has imported 16,689 cars and trucks into Japan, up 132 percent over the same period in 2002. To all the "journalists" that wrote that the HSC might not be next NSX. dropping FWD on the RL eh? Is it getting the hybrid system or no?? Now all we need is an update on the new CL. I read in C&D that they have to massage the styling up front a bit to distance it from the Enzo (as it appears to resemble) but otherwise that's pretty much what we'll see. wow....is that the new vette/350Z/lumina joint venture? I love it! Let's hope it has more than the 300hp. Repost. Merging to original thread. Looks like a Corvette in the rear. Looks like a true exotic, but the production car probably wont look like that. I'm glad they are changing things up bucause the current NSX looks very dated. I dont like the front. The hood is too plain.. its just a flat piece of metal, no nothing. The lights are very square.... wish they were shaped more aggressively. Awesome rear though; I reallly like the 80s-esque dark mirrored led brakelights. I think those look AMAZING. I like that it's very Ferrari like (a sharper enzo if you will, i wish the enzo looked like this)... but i've read they will change that to make it look more Japanese. I think it looks great but the tail and headlights will likely be changed in the production model.